Now holding Reiki Workshops and Classes in Greater Lancaster, PA! Anyone can be attuned to Reiki energy. Treat yourself to daily mini-sessions and feel and BE calmer and more relaxed! Share Reiki with friends, family, pets, plants - you name it! We are all connected by a shared energy life source and Reiki helps put that connection, quite literally, in your hands. Reiki is a Japanese technique for stress reduction and relaxation that also promotes healing. It is based on the idea that we all have an unseen life force "energy" which flows through us. When our energy is low, we are more likely to feel sick or stressed. When our energy is high, we are more capable of being happy and healthy. Reiki treats the whole person including body, emotions, mind and spirit. It is a simple, natural and safe healing method that has been effective in healing illness and dis-ease. Working in conjunction with all other medical or therapeutic techniques, Reiki relieves side effects and promotes recovery. 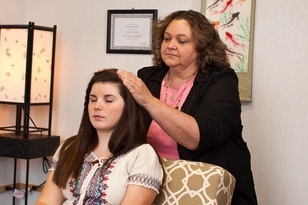 A Reiki session is a calming and relaxing experience. We will start with a brief discussion about any issues you may be having difficulty with. You will then lie, fully clothed, on a massage table. (Accommodations will be made for clients who are unable to lie on their backs for their session.) Reiki energy is passed from the practitioner to the client as the practitioner gently places their hands on, or slightly above, the clients' body. Reiki is not a massage, but a subtle energy treatment which will help to balance and align your energy systems to promote healing for the body, mind, and spirit.